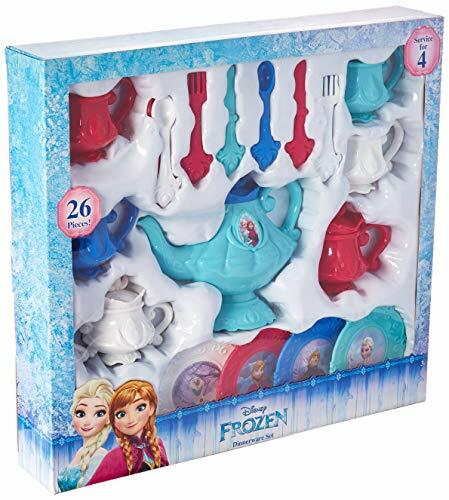 We have collected hundreds of cool Disney's Frozen gifts with Princess Anna of Arendelle, Elsa the Snow Queen, Olaf the snowman, mountain man Kristoff and Sven the reindeer. Check out More... our collection of Frozen apparel for boys and girls, Frozen toys & games, party supplies including Anna & Elsa party favors and Frozen tableware, as well as Frozen prints, phone cases and more. Great Frozen merchandise here for anyone who loves Disney's animated hit feature film Frozen. Don't forget to check out our toys section for Frozen games, Anna & Elsa dolls and more. This fun toy tea set includes 26 pieces of dinnerware suitable for play tea parties, doll meal time, and other creative pretend play. With this set you'll get 26 pieces of Frozen-themed doll-sized dinnerware, including 4 each of forks, knives, spoons, plates, and mugs. The set also comes with a tea pot, creamer, and sugar bowl. This colorful plastic play set has pieces in white, red, blue, and teal. Images from Disney's Frozen are included on the larger pieces and Nordic-style design motifs are also featured. 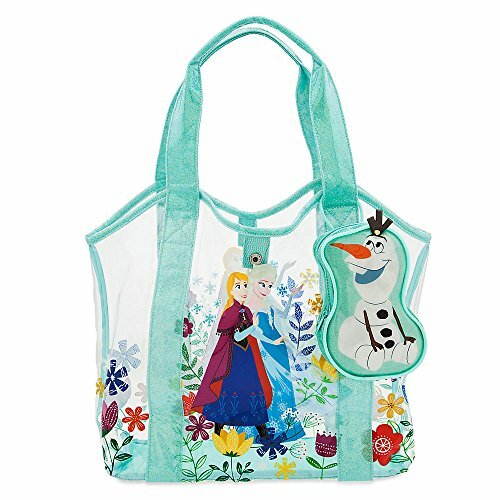 This fun beach bag is made of sturdy PVC and features a cartoon-style image of Anna and Elsa from Frozen. The tote comes with a matching small zippered pouch with an image of Olaf. This transparent tote bag has a snap closure. The trim and handles are light teal with a pretty glitter shine. The design features the Arendelle sisters in their familiar adventure outfits with a Nordic-style summer feel floral background. The matching small pouch featuring Olaf is attached to the tote handle and can be used to safely store small items you will bring with to the beach or pool. 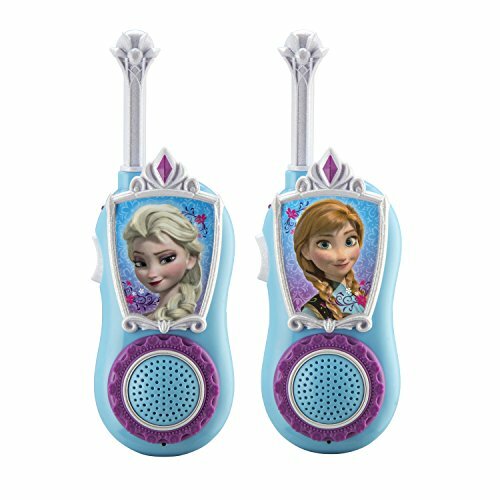 This is a pair of easy to use walkie-talkies inspired by Frozen. The "chill 'n' chat" set is illustrated with images of Anna and Elsa and Nordic design motifs from Frozen. Little Frozen fans will love using these easy real working 2-way walkie talkie radios. Control the volume when listening and push the button to talk -- it's that simple! Use these cute radios for creative fun! Play a unique game of hide-and-seek, experience outdoor adventure, and use when camping! 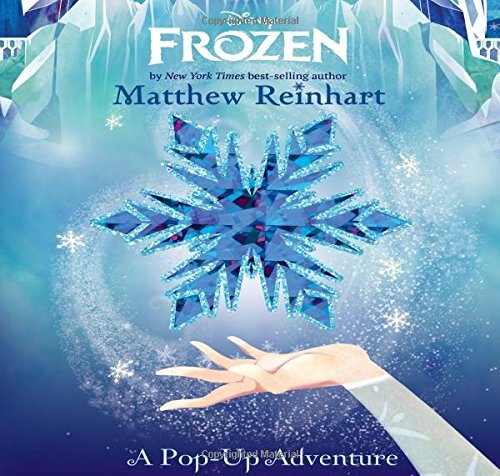 This is a fun interactive pop-up book made just for young fans of Disney's Frozen. This beautiful book is like a work of art containing unique and surprising pop-ups inspired by Frozen. This is a 12-page book aimed at young readers aged 8-12 years. The book tells the familiar story of Elsa and Anna using beautiful color 3D illustrations by famed pop-op artist Matthew Reinhart. Each illustrated page comes to life with 3D pop-up art, extra folded details, push-pull action, and more. 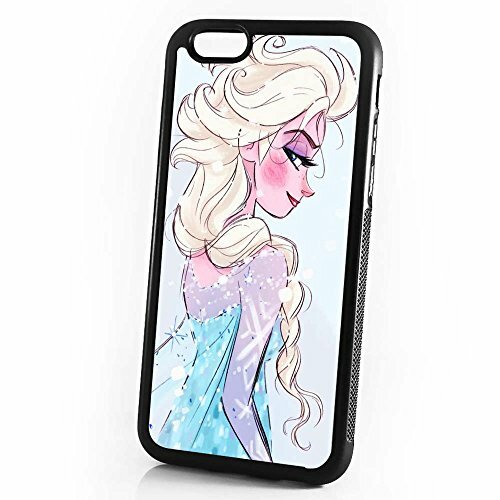 Protect your iPhone 8 or 7 Plus in awesome Frozen style with this great pencil-style drawing on a sturdy iPhone case. Elsa looks over her shoulder in her signature ice gown in this sketch-style illustration. This is a soft gel case for iPhone 8 Plus or iPhone 7 Plus. It has textured grippable sides for ease of handling. The vibrant print make this hardy case stand out!